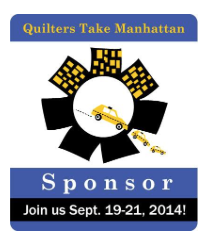 Quilters Take Manhattan Ticket Giveaway by Aurifil!!!!! Quilters Take Manhattan, the once a year extravaganza hosted by the Quilt Alliance, has grown every year adding classes, tours and special contests to the delight of the quilting community. Although all of this is fun, the Alliance has a very important purpose in the preservation and education of the quilting arts. to educate Americans about the importance of documenting quilts and quiltmakers so that their stories will not be lost. 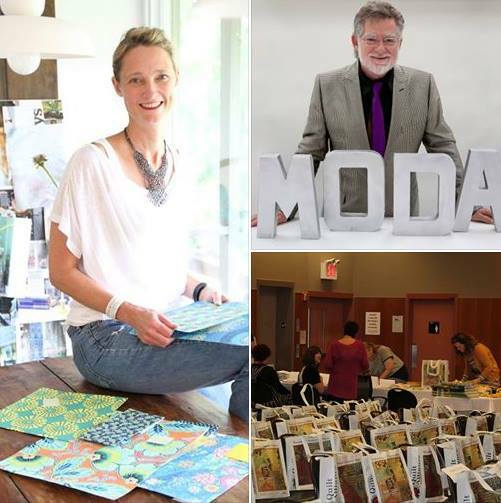 This year’s event speakers include the very talented designer Amy Butler and the president and owner of Moda Fabrics, snazzy dresser, and Quilt Alliance board member Mark Dunn, a beautiful quilt exhibit and a goody bag that will make you drool! Everyone that attends this event is inspired to go home and create! The Quilters Take Manhattan 2014 has completely sold out ( you can still buy tickets for the at home option) but Aurifil has a wonderful surprise! Two people will win one ticket for the SOLD OUT day event at FIT in NYC and one ticket for the After Hours party at the loft of Victoria Findlay Wolfe.